Your dog is more than a pet. Your precious pup is a part of the family. You love and cherish your four-legged companion and want only the best in care for your baby. That's why you have to be highly selective when it comes to dog boarding Michigan. You want more than a place to stay for your dog. You want your pooch to enjoy a home away from home. Turn to the Paw Print Inn Pet Resort and Spa for luxury dog boarding. You'll have peace of mind that your dog is getting the best care while you are away. When you send your dog to the Paw Print Inn, your pooch will get a high level of quality care from dedicated staff members. Your pup will have morning and afternoon play sessions. Don't forget about room service and housekeeping to keep your pet's area fresh. Premium bedding and food are a must. The climate is controlled to be maintain a pleasant atmosphere. Soothing music is included as well to complete the package. Your dog is a priority for you and a priority for the staff at Paw Print Inn. No one wants to leave their dogs when it's time for an extended stay away from home. You might not have a choice when it comes to finding boarding for your beloved companion, but you do have a choice when you choose dog boarding. When you want the best for your dog and you want your pooch to have a touch of luxury, turn to the Paw Print Inn. At the Paw Print Inn, your pet will have a delightful stay in a club suite that will accommodate your dog's size. You can even step it up for an added fee for a Signature Suite. Your pet will enjoy wonderful bedding, lamb and rice food of a premium level, as well as a selection of optional services. Give your pup the gift of a personal play session, extra TLC, a massage, and a story at bedtime before a tuck-in. Splurge on special treats and vacation photos. While you are away, make sure your pet is pampered. You won't have to worry a single minute when your pooch is enjoying a pleasant stay at the Paw Print Inn. I love that they have things like this for dogs. My dogs would probably have a lot of fun there. Little Bit won't eat if we board her, so we have a family member house/baby sit. It works good. We don't do it often anymore, but it works for us when needed. It's so important that they are comfortable wherever they are. 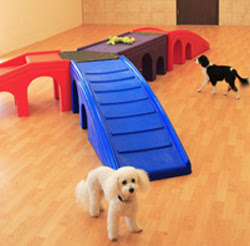 I just checked out their site and this doggy hotel looks amazing! So nice and clean, and they even have cameras set up in all the room so you can check on your pup while away. Love it! It sounds like they really take care of the dogs they take in! I would definitely use the Paw Print Inn. Pets are such a large part of our lives, It is so cute to see that this is available for all of them! Cute doggies! I only have cats, but I can only imagine that you really want to find a good place for your dogs when you have to be away from them. This is perfect for when you're going on a vacation. At least you know your dog is cared for. We don't have a dog... but we have a cat that acts like a dog. Not quite the same.. but equally as important. Always a good thing when you can find a place you trust to watch over your pet when you leave town. This sounds like an amazing place for doggy daycare. It can be so hard to find a good place to trust your dog. Pets have the coolest things. Thank you so much for sharing! Dog hotels and doggy daycares are such a great option. I love how nice this place looks, too. I have to remember to suggest this when friends are going out of town and are trying to figure out how will watch their family dog! Thankfully we have relatives nearby so we don't often have to leave our dogs. I know that I would feel really secure leaving them there though. Wow! What a cool (and fun!) place for your pups! Very cool! This looks like a fun place to board dogs. I'm glad places are not just shoving dogs in a small kennel or cage for extended periods of time. They need exercise too. What a great way to feel at ease about heading off on a vacation! My dog got kicked out of our favorite boarding facility. She was just too hyper for her own good lol. Sounds like they know how to handle the dogs that come in their care. If they were closer, we'd definitely consider them. It's stressful to find a good place to trust with your dog. I always feel bad leaving ours. I totally agree with the others... so much easier to enjoy your vacation when you know your fur baby is safe, well cared for and is having fun. There aren't many places here to board an animal. What a lovely place to visit. That place looks comfortable and I'd love to visit there one day. This is perfect for two puppies, I'm sure they would love to stay in that place. I don't think my 70 lb golden would use this, but I am sure she would chase other dogs. This sounds like a great place. We could never find someplace good enough for our precious dogs and always had to have someone come stay with them in our house! Sounds like a great place! My daughter has a dog and I know the difficulty at times to find someone you can rely on. I am always so worried when we board our dog... but it makes it so nice to know they're in good hands. Those look like very nice accommodations. Like a vacation for your dog, too. My friends here in Colorado are looking for a good place to board their dogs too when on vacation. it is a tough decision. Love my girl Paris. She is my pal. I have never had to board her because my mom always agrees to stay with her. I don't have a dog but will share this info with my friends! This sounds like a fantastic place to bring your dog when you go on vacation. I love all the fun activities they have for them. The different suites are amazing and I love the signature suite with all the extra bonuses. Thanks for sharing.